What Do You Mean, Common? Now that we have lived on the farm almost seven years, I am familiar with a lot of the plants, insects, reptiles, and birds that I see regularly. But almost every day, I run across a species that is new to me, or I get a picture of one I couldn’t capture before. In that case, getting and editing the pictures doesn’t take half the time that research does! I try to figure out the basic family, look at the pictures in all my guidebooks, look online, and sometimes even request an ID from an expert. Of course I always hope I have discovered a rare species, but after all my searching, it always turns out that the specimen is extremely common! When I took a picture of this one, I thought I was getting some butterfly in the skipper family. After looking at it on the computer, I realized it was some sort of bee look-alike. From my trusty Kaufmann Guide, I narrowed it down to “bee fly.” Then I went on BugGuide.net, and there were 100 pages of images to look through! Which I did. Every single page. And then, I went ahead and asked for an ID. Sinuous Bee Fly, Hemipenthes sinuosa. 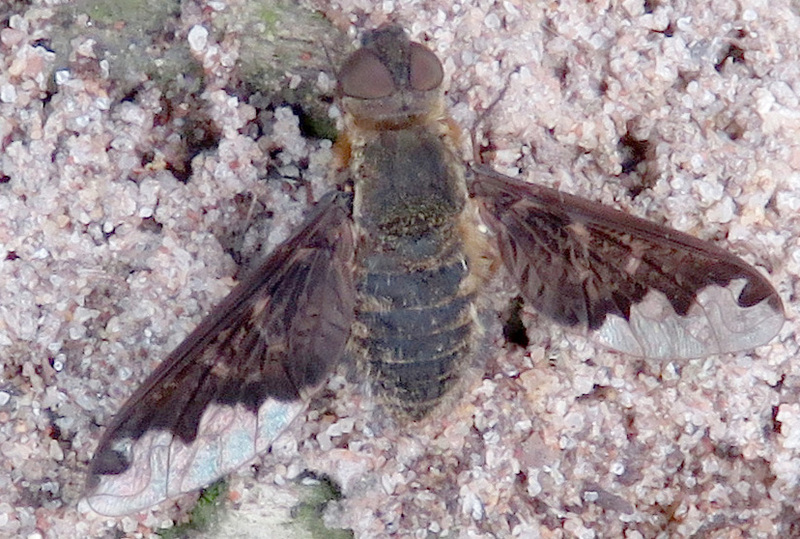 The answer came back in less than a day — it is a Sinuous Bee Fly, named for the curves in the pattern in its wings. The Latin name of this fly family is Bombyliidae, which is apt, because their heavy bodies look like little bombs. This genus Hemipenthes has about 85 species in it (one with the incredibly wonderful name of H. tusheticus mongolius). And, if you’ve ever heard of those wasps who carry off caterpillars and spiders and paralyze them and use them as hosts for their larvae, and thought, “That is so not fair,” well, the Hemipenthes enact a little cosmic revenge, because in their larval stage, they are hyperparasites, which means they parasitize those parasites! And then they grow up and metamorphose and become important pollinators. I felt better about never noticing a bee fly before, when I read that although this family is huge, the individual species don’t appear in abundance. Then I had another proud moment when I got some good photos of this damselfly. Do you know how hard it is to get any picture of a damselfly? Most of them are about 1.5 inches long (4 cm) and they are incredibly thin. They keep moving, and when they land it’s on a blade of grass surrounded by thousands of other blades of grass, any one of which my camera would rather focus on than on the damselfly. So out of dozens of pictures, I got about two that were focused. Then I looked through John C. Abbott’s Damselflies of Texas page by page (all of them), because I don’t know the damselfly families. And there are dozens of blue damselflies. Fortunately in my internet hunt for damselfly factoids, I found this fabulous group of Familiar Bluet photos by Greg Lasley. He has many pictures of insects in Texas, so I know I will be checking back there to help me identify more insects. That bugguide.net is sure a cool site. I wish there was something like that for help with the ID of grasses. I have lived on our farm for 16 years and there are some grasses that I don’t remember seeing before that I haven’t identified yet. I know! I went to a grass ID class one time, and I thought, “I love this! I am going to become an amateur grass specialist.” But I promptly forgot the Top 5 Grasses of Texas that were highlighted in the class. I have bought about 4 grass ID guidebooks, but I haven’t gone out and used them yet. It is too easy to think, “Oh, grass, that will be here next year,” and then focus on IDing a bug I’ve never seen before. And I was talking to the 75-year-old farmer who grows hay on our place, saying that it seems like different wildflowers grow in abundance every year, and he says he still notices that too, that something that wasn’t here the last few years pops up all over. Wow, that photo of the damselfly IS truly spectacular! Absolutely beautiful photo of the damselfly! Great photos; and here I thought my camera was the only one that had a focusing problem! !